The BRITEX Stainless Steel Square Drinking Fountain is supplied complete with a heavy duty push button bubbler and waste outlet. A service hatch provides access for installation and maintenance requirements. 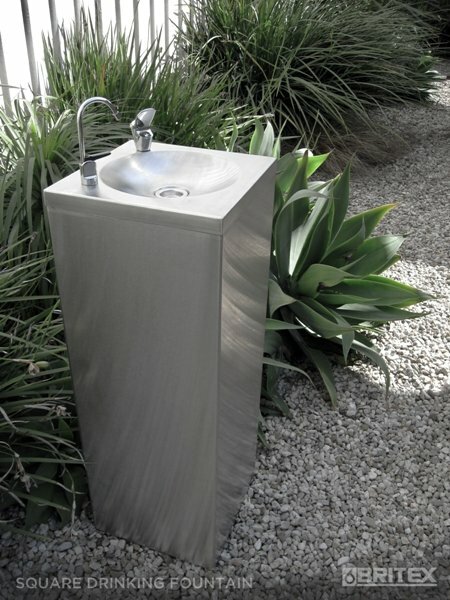 Manufactured from 1.2mm commercial grade 304 stainless steel the Square Drinking Fountain is secured to the ground below with a fixing plate inside the base and is suitable for public reserves and sporting clubs. Two standard heights are available (975mm or 750mm for schools) and a bottle filler is optional. Britex 'CoastGuard' - a clear coating option that protects against the onset of tea staining caused by salt air - is recommended for installations near the ocean.